The Faint Sun paradox was first proposed by Carl Sagan who pointed out that the geological evidence that liquid oceans existed on Earth 4 billion years ago appears incompatible with a solar output 30% dimmer than today. The sun is a main sequence star whose output is known to increase slowly with age. However the change in solar radiative forcing over this long period turns out to be huge ~ 87 w/m2. It has been argued that an enhanced greenhouse effect due to very high CO2 and/or CH4 concentrations could resolve this paradox . However, recent geological evidence does not support CO2 as being responsible but instead the authors propose a greater ocean surface leading to a lower albedo as a likely solution . Others have suggested that high cirrus clouds effectively warmed the Earth . Although the atmosphere must have been very different before photosynthesis began, the presence of large liquid oceans still implies that clouds and water vapour played the same role in the Earth’s energy balance then as they do today. All current IPCC models adopt positive net feedbacks of water vapour and clouds with increased radiative forcing. A doubling of CO2 leads to an increased radiative forcing of 3.6 watts/m2. Without any feedbacks the surface temperature is then predicted to warm by about 1 degreeC restoring global energy balance through increased outgoing Infrared. IPCC models only predict larger temperature rises because they assume positive feedbacks. What do these positive feedbacks imply for the Faint Sun paradox? 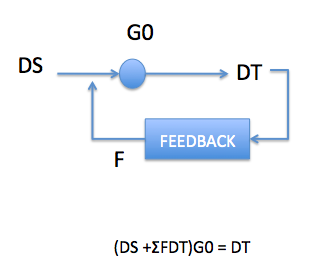 DS/DT = 4sigmaT^3 (= 3.75W/m2K-1 for T=288K) This is essentially the term G0 in Figure 1. DT( 4sigmaT^3 -F) = DS or DT =DS/(4sigmaT^3-F) equation. 1. The main feedback estimates used by IPCC models concern water vapour and clouds. The total feedbacks used range from +1.6 to 2.5 giving an average total positive feedback of ~ 2.0 W/m2K-1. Only with these feedbacks does a doubling of CO2 lead to larger temperature increases of 2 to 5 deg.C. If however it turns out that total feedbacks are actually negative or zero then global temperatures would rise only 0.3 to 1.1 degrees C.
This can now be integrated over time to give predicted temperatures. This can be done two ways. Firstly we assume that the temperature 4 billion years ago was 280 degrees, since we know that liquid oceans were present. This result is shown in Figure 4. 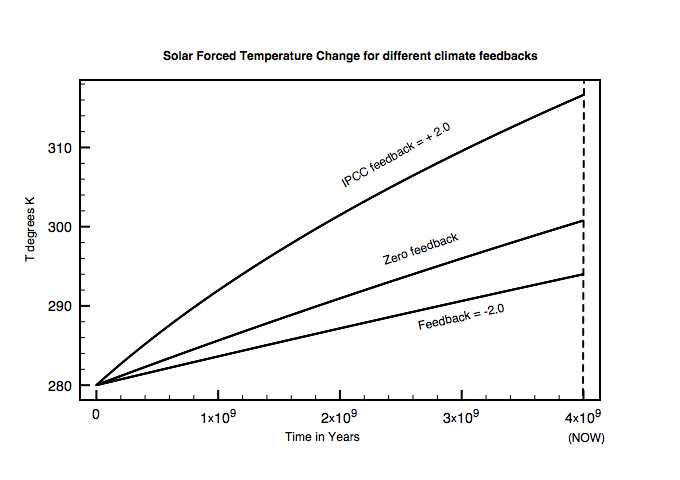 It is clear that positive feedback of +2 as used by IPCC leads to unreasonably high temperatures as solar radiance increases and appears to be wrong. Instead a negative value of -2 w/m2K-1 is more compatible with current temperatures. The second way of calculating temperatures is instead to fix the current temperature at the observed 288K and work backwards by subtracting DT from solar forcing every million years. It is here that we see the basic problem of (linear) positive feedback models. If the temperature falls enough so that 4sigmaT^3 = F then we get a singularity. 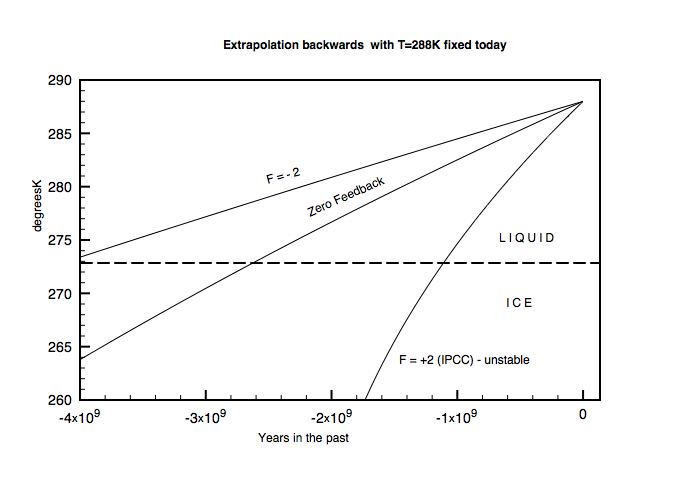 The results of this “hindcast” calculation are shown in Figure 5. This result shows that the assumed feedbacks in IPCC models are incompatible with the Earth’s early history because of the fact that we know that the planet has been continuously covered in liquid water. I find it very difficult to accept that the net effect of water on climate can be a positive feedback. While it is true that water vapor greenhouse effects depend on surface temperatures though the Claussius-Claperyon equation, high and low level cloud change to the Earth’s albedo seemingly must be more important. The evidence is that global surface temperatures have changed little over the Earth’s history. This is incompatible with a simple linear net positive long term feedback from water vapour and clouds. 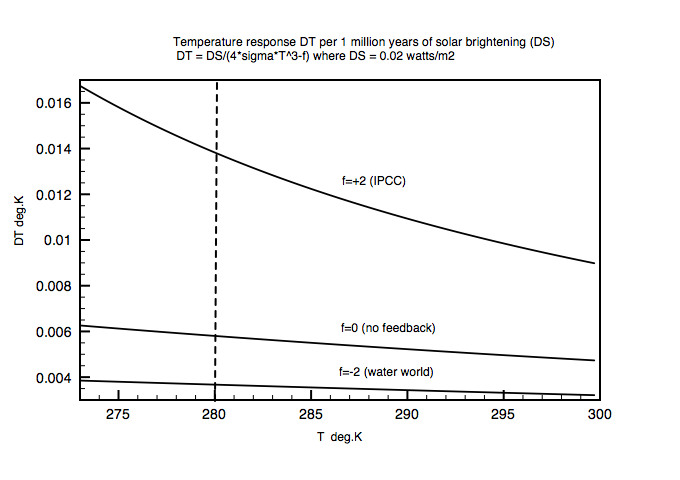 During the early lifetime of the Earth the total feedback from water must have been negative to avoid run away surface heating as the sun brightened. This entry was posted in Climate Change, Physics and tagged CO2, Faint Sun, IPCC. Bookmark the permalink. or desert daytime, low moisture and hot v tropics – cooler. night time desert – swift cooling v tropics- slow cooling.